We ran across this ferry by adventure; A Mother’s Day journey. We were heading back towards Mystic, Connecticut for a Mother’s Day lunch when we came across the town of Deep Water; with a name like that we had to pull in and investigate the backroads, and in doing so we came across the Chester-Hadlyme Ferry.. it is a seasonal ferry that crosses the Connecticut River between the town of Chester, Connecticut and the village of Hadlyme and has been in service for over 200 years. Jonathan Warner of Chester, who owned land on both sides of the river, started a ferry service at this location in 1769. It was then known as Warner’s Ferry and utilized a raft propelled using a nail and long poles. It is the second oldest continuously operating ferry service in the state of Connecticut. The ferry was often used throughout the American Revolution to transport supplies across the Connecticut River…. 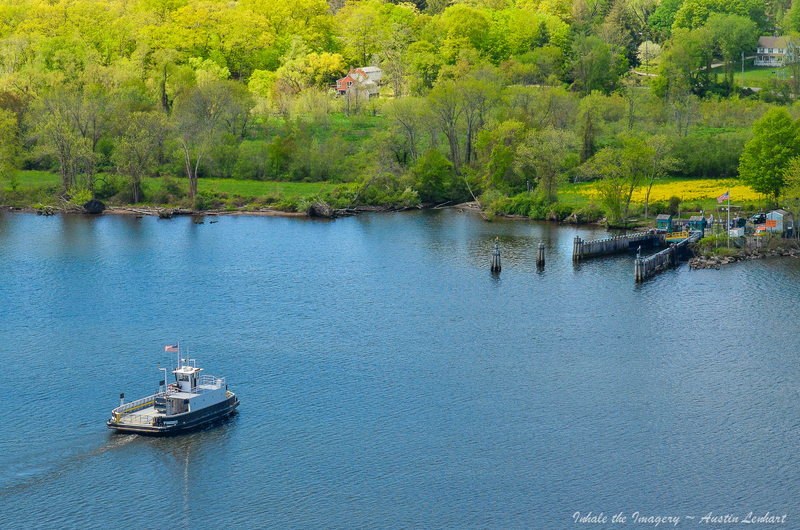 Was a great find and made our day… The shot is taken from above, looking down at the ferry and ferryman heading back to the other side… The Ferry has been run by the Connecticut Dept. of Transportation since 1917…Sun rises to the left of the shot.